Plot A group of girls staying at a sorority house clash with the house's owner, who wants them out. They decide to play a prank on her, but it goes awry and she winds up dead. Panicking, the girls try to hide the body, but someone (or something) witnessed the crime and begins to stalk them. I checked out the latest incarnation of The House on Sorority Row this evening. I remember finding the early DVD release at a used movies and music store. I purchased it, came home, and read online about a new two disc edition coming out soon. When it did, I picked it up. Then I picked up the BD release. Continuing the trend, I bough Scorpion's latest BD release. I hope it's the last time, but I will say that each rendition has been a serious upgrade from the previous so I don't feel too bad about how many times I've snagged this title. How does the new BD release compare to the old one? It's been color corrected and looks even better. Everyone's skin tone looks healthy and colors pop rather than appear dull.I wish I had screen shots to show the comparison (there is one of actress Kate McNeil below thanks to Mondo Digital), but I'm unable to do so. Mondo Digital has them up to see though. I'd place House in the middle to upper tier of slashers. It's solid with it's premise, the cast of victims, the setting, and the killer. Where it feels limp are the murders. They revolve around the use of a cane. Make no mistake, there's plenty of use to be had as it's used to slash, stab, and bludgeon. Where it falters is how quick the kills are, dampening the impact. Then there's the second murder that takes place in a silhouette as the victim is stabbed. Why is this left to the imagination when the audience was just shown minutes earlier someone getting stabbed? There's no reason to leave it to the viewer's imagination. I never thought about it until recently, but this is yet another mongoloid killer. When Friday the 13th came out, it opened the floodgates for the slasher genre. Sure, they could emulate Halloween to an extent like Friday had, but they probably wouldn't be executed to the same degree. Something else was needed--gore. But there's another element that is overlooked and that is making the killer sympathetic. Michael Myers is just evil incarnate. Hard to empathize with him, but it's easier to relate to a mother's pain such as in Friday or House. Same goes for the mongoloid in Humongous. Notice how many slasher villains following immediately after Friday the 13th Part 2 are deformed sons? 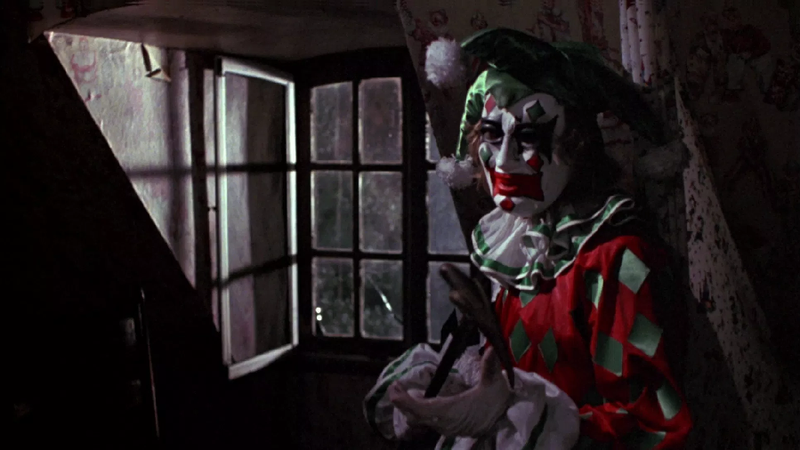 The killer in The Funhouse was also misshapen, but my memory as to his backstory isn't so hot and I can't recall if he was portrayed as a tragic character or not. Any others that come to mind? One other detail that caught my attention is the music by Richard Band. When Kate McNeil's character is running away from the doctor, there's a sequence of music with trumpets blaring. It reminds me of the music in Laserblast (also by Band) when the two guys leave the party and head towards the car moments before Billy is seen on the nearby hilltop. In the MST3K version, it's when the joke about how the car horn is "stuck in some kind of bebop rhythm". I swear Band reused it for this film. And now for the most famous line in the entire picture. The actress gets a lot of flak for how bad her delivery is. Honestly, it's far from being the worst delivery in a horror film or even a slasher. That honor probably goes to drek like The Last Slumber Party or something. What makes it stand out is how on point everyone else is. Their delivery not only sounds natural, but there's a constant beat between each person's dialogue. Morgan (Jodi Dragie in her only role) sounds unnatural and disrupts the flow making it stand out. 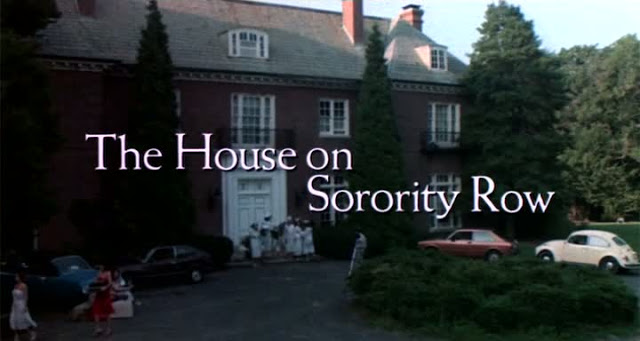 On this umpteenth watch of The House on Sorority Row, I maintain that it's still a solid number all around. It's not for gorehounds, but it's strong in characters and pace. It's disappointing to see a movie get an upgrade in format (VHS to DVD to Blu Ray to 4K), but not an upgrade in quality due to a bad transfer. If you do not upgrade the visual and/or sound quality, what's the point? There are extenuating circumstances. Sometimes it's nice just to have the movie available again. I'm sure there are probably a dozen classics that serious collectors have that are only available on VHS. Some of my old tapes were rotting/degrading (Day of the Dead, for example) that they were simply not watchable anymore. Sometimes you cannot get a good transfer because the quality of the print is bad (The Children and Meet the Feebles come to mind). I picked up several movies in the early days of DVD; some were a dramatic upgrade from their VHS counterparts. However, I remember watching "The Unforgiven" and being disappointed by how grainy and pixelated it was. Why would such a mainstream movie look so bad on a new format? On the flip side, a movie like "The Dark Knight" is one hell of an upgrade on Blu-Ray. Like you, I've bought the same movie a few times. Halloween II on VHS, then DVD, then the Blu-Ray collection, and then the special edition Blu-Ray (if, for nothing else, Terror in the Aisles). This is one of those classic slasher movies that, again, if it wasn't for the F13 community (or these forums)... I would have never seen. We did this one during a chat one night. I believe I saw this one available on the shelves in the video store around the mid-80s, but we never got around to renting it and it almost faded from memory completely. Once I get my hands on my old collection again... if I don't already have this movie I'll have to pick it up. I do think with each new edition, House looks better and better. I'm honestly good with the latest rendition. Good news is that it's getting a wide (and somewhat even cheaper) release by Scorpion soon. Only thing missing is the slipcover.